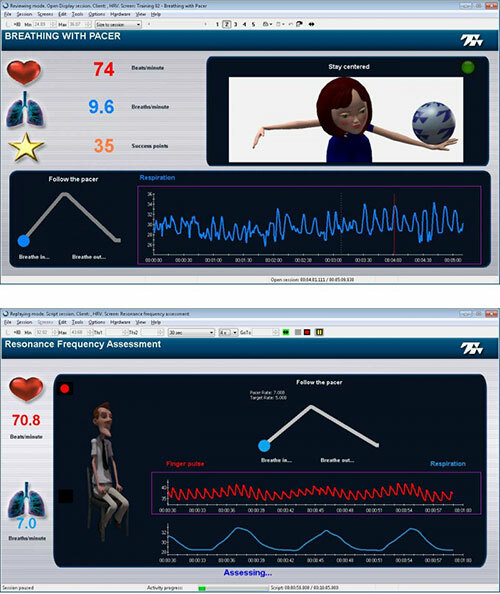 Heart rate variability biofeedback is a powerful method for exercising your client's cardiovascular system. Teaching your clients to practice slow regular breathing exercises as often as possible, 10 to 20 minutes a day, will help them learn important self-regulation skills and maintain higher levels of heart rate variability. Assess and document your client's baseline HRV levels by running the 3 step HRV assessment. Teach your clients awareness and control of breathing patterns and how breathing influences heart rate. Train your clients to use breath control to entrain deep and effective relaxation. The HRV Suite works with the ProComp 2, a medical grade physiological monitoring device, with easy-to-fasten finger pulse and respiration sensors to provide direct measures of heart rate and breathing. Or for customers who want to add the suite to their newly purchased ProComp 2 system with EEG or Physiology suite.